Automatically generate a SKU for parent / simple products, variations, or both when the product is published or updated. IMPORTANT: The SKU field will be disabled for SKUs being generated by the plugin. Your own previously created SKUs will be overridden if you update a product while generating SKUs, and they will change if you change your product slug (while using this to generate them). Be sure you want to complete automate SKUs if you leave this enabled all of the time. You can also selectively enable and disable the plugin if you don’t want to override existing SKUs when saving products. You can view product documentation for help. SKUs for simple, external, or parent products can be generated from the product’s slug (hyphenated name) or ID. 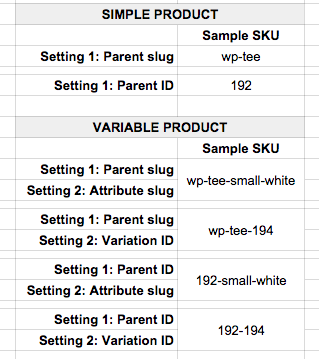 For example, a product with the slug wp-tee-shirt can have a SKU of wp-tee-shirt or 192 (whatever the product’s ID is). This SKU will be generated any time the product is published or updated. If the product is a variable product, this plugin can also generate SKUs for the product variations if desired (these typically inherit the parent SKU). Variation SKUs can either append attribute slugs or variation IDs for each variation to the parent SKU. Here are some samples of different SKU formats that can be created with this plugin. You can also manually set simple / parent SKUs, or manually set the variation SKUs, if you don’t want the plugin to generate them for you. The WooCommerce Product SKU generator lets you determine which SKUs should be generated automatically, and whether these SKUs should use product slugs or IDs. If a SKU is generated, the input for that SKU will be disabled since you cannot adjust it. If you choose not to generate a SKU, then you can enter your own SKU. For example, if you only generate variation SKUs, then you can enter a parent product SKU. This will be used as the base for your generated variation SKUs, and slugs or IDs will be appended to it. If you only create parent / simple SKUs, you will be able to manually create your own variation SKUs, as these will not be overridden by saving or updating a product. You can bulk add SKUs to products that you’ve created prior to installing this plugin. If you select the products you want to update, then bulk edit them, all you have to do is hit “Update”. When the products are saved, SKUs will be generated for all products. This action will also automatically generate the SKUs for product variations if you have them enabled. If you enable the setting to replace spaces, this will instead look like: parentSKU-Burnt_Marshmallow or parentSKU-Burnt-Marshmallow — depending on which setting you’ve chose. This is helpful if your external fulfillment service does not allow spaces in SKUs. In very rare cases, you may find that variation SKUs do not sort attributes in the same order. For example, one variation may be tee-shirt-large-black, and another could be tee-shirt-black-medium. If this occurs, you can force attributes to sort themselves consistently before generating the SKU, which will resolve this problem. You could also consider this for new installations. Be sure you want to enable this if you have existing SKUs, as variation SKUs that were generated previously could be overridden while updating a product – they’ll be re-generated with the forced attribute order. NOTE that any time a product is updated, its SKU will be generated, so this may override old SKUs if you update products. This plugin is meant for complete SKU automation, or you can selectively enable / disable it as needed. Be sure you’re running WooCommerce 2.5+ in your shop. Click the “Configure” plugin link or go to WooCommerce > Settings > Products and scroll down to the “Product SKUs”. Select which SKUs you’d like to generate and what should be used to generate them. If you generate variation SKUs with slugs, determine if spaces in attribute names should be replaced with underscores instead. What happens to my old SKUs? This plugin generates SKUs any time products are created or updated. Your old SKUs will be overridden if you use it – only leave the plugin enabled if you don’t want to manage SKUs yourself. You can also selectively disable and re-enable the plugin if you don’t want to override SKUs when saving products. How do I add SKUs to old products? Select the products you’d like to generate SKUs for under Products. Go to the bulk actions in the top left and click “Edit”, then apply. All you need to do is hit “Update” to save these products, and SKUs will automatically be added. Why does whatever I enter for the variation SKU get overridden? Variation SKUs can be set manually if you’re not generating them. They will be overridden if your settings are set auto-generate them, even if you try to change them manually. Please check your settings here. If you’d like to change a SKU for a product, disable the plugin, change the SKU, and update the product. You can re-enable the plugin as needed. I’m using IDs for SKUs. Will they be sequential? Roughly, yes. Actually, no. The SKUs will increase as you add more products / variations, but these use the post ID from WordPress (similar to your orders). Each SKU will be higher than the last, but they won’t be exactly in order, as other posts (like blog posts, orders or products), also use the same ID counter. Your SKUs will increase, but skip numbers. Can I use something other than the product slug to generate the SKUs? Yep! Version 2.0 added the ability to use product slugs or IDs. For more advanced uses, you can use the wc_sku_generator_sku filter, which passes the parent SKU as the value and the product as a variable, to change what’s used as the parent SKU. You can change the variation SKU using the wc_sku_generator_variation_sku filter. You must use a unique value for SKUs (WooCommerce checks this). For example, you could generate a unique string or number in a custom snippet to use for the SKU with the help of a developer. Sometimes attributes for my variation SKUs aren’t in the same order. Can I fix this? We’ve seen this happen in only one situation, so we have a filter + code snippet rather than a setting for this. Please see the instructions in Other Notes to force the attribute order. Great Plugin – Perfectly done what they mentioned! Good Plugin if you want to save your time to add SKU for each variation. SKU Generator is a brilliant plugin!! Support was extremely quick and helpful. This is so much better support compared to some of the support from the plugins I have paid for. They go beyond than expected. Thanks guys and keep up the good work! Hey I am amazed! I pay for some services that don't have this speed for answer and this broad showing of what to do. Congratulations for ur job here, and for the plugin. It did just what I needed! Thanks a lot Best! “WooCommerce Product SKU Generator” is open source software. The following people have contributed to this plugin. “WooCommerce Product SKU Generator” has been translated into 2 locales. Thank you to the translators for their contributions. Translate “WooCommerce Product SKU Generator” into your language. Misc: updated text domain to woocommerce-product-sku-generator — please update translations! Misc: introduce wc_sku_generator_force_sorting filter to force attribute sorting in SKUs, props @humancopy! Danish, English (US), and Greek.